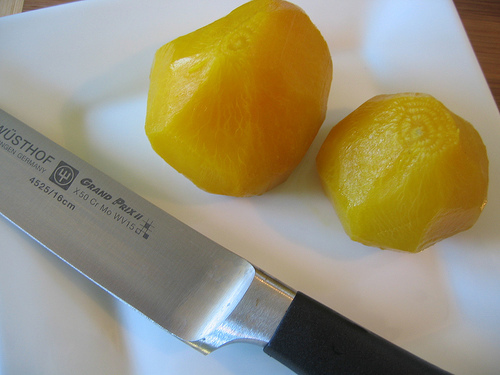 Jun 9 kitchen skills: sharpening knives gives me the chills. How ironic, how absolutely hilarious yet awkward: my little peeve of knife sharpening. Here I am, front and center, a new culinary student and one of my personal fingernails-on-the-chalkboard [sends chills down my spine] is the noise of knives sharpening. Ask my parents, they will tell you. As a little girl if ever the knives were scraped against steel, I would clamp my ears shut as quick as a mouse grabs cheese (and likely scamper out of the room). So you can imagine my secret concern, my fear of the time when knife skills rocked my world and every peer near my shoulder would be obsessed with sharpening, honing and otherwise scraping their knives at every opportunity. In the least, it showed they were serious about their agenda in the kitchen. Like giving a permit-driver a race-car; a new culinary student, just learning to wield his or her sword, is a sharpening fiend. I have been in school for 8 weeks and still have not sharpened my knives. Eh, don't cringe, I haven't been using them yet. I am still in the lecture class and baking, remember? But I HAVE noticed how insanely dull my knives at home are (small glitch---! still haven't figured out how to clamp my ears closed while sharpening my knives), and it is beginning to annoy me. Ha, so when the dullness annoys me more than my loathing of scraping sounds, then I will sharpen my knives. And that is my plan. And guess what finally pushed its way to the top of my list of things to do? Sharpen my knives. I think it was reading Anthony Bourdain go on and on about knives in his book, Kitchen Confidential (refer to page 76 if you are so inclined). My favorite is when he rants on about garlic... but that is another story for another time. Because today, my friends, was no small feat: I sharpened 7 knives, without even cringing... no doubt, the chef hat helped.